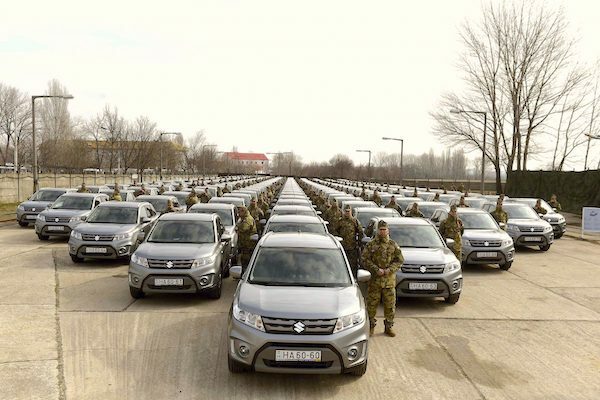 The Suzuki Vitara continues to dominate the Hungarian sales charts. New car sales in Hungary are up a stunning 30.9% year-on-year in March to 12.748 units, lifting the Q1 volume up 29.8% to 31.609. Brand leader and local producer Suzuki frankly outpaces the market once again with a fantastic 54% uplift in March resulting in a 72% uplift in Q1. Ford (+27%) is back above Skoda (+35%) this month and YTD above Opel (+32%) while Toyota (+27%) overtakes Volkswagen (+18%) to land in 5th place YTD. Renault (+82%) posts the largest year-on-year gain in the Top 10 while Hyundai makes a rare appearance in the Hungarian Top 10 brands. Model-wise, the Suzuki Vitara advances three times faster than the market at +90% to 11.5% share, cementing its YTD leadership at +68% and 9.5%. The Skoda Octavia (+51%), Ford Focus (+183%), Opel Astra (+123%) and Suzuki S-Cross (+61%) follow and all beat the market. Notice also the Hyundai i30 at #10. For the first time Datahouse and local media outlet autonavigator.hu published details of sales by channel for the Top 10 best-selling models in the country as well as re-export rates. Widespread in Eastern European markets such as Bulgaria and Estonia where car prices are lower than in other parts of the European Union, re-exporting is the practice of purchasing a car as new in a low-price country then immediately export it to other markets in the EU where it is sold at a profit as a 0km used car. Re-exports affect 13% of all new cars sold in Hungary, with the biggest culprits being Jeep (60% re-export), Nissan (43%), Fiat (36%), Ford (28%) and Renault (25%). Therefore the Ford Kuga (#6), Nissan Qashqai (#7), VW Jetta (#9) and Renault Clio (#10) disappear from the Q1 2018 Top 10 when re-exports are deducted, instead the Toyota Auris (#7), C-HR (#8), Opel Corsa (#9) and Skoda Fabia (#10) make their appearance. By channel data also shows the Vitara remains tops with private buyers above the Suzuki S-Cross and Toyota Yaris while the Skoda Octavia is king of fleet (87% of its total sales). Full March 2018 Top 10 brands and models and Q1 2018 Top 30 models below.